Lois Hatfield Anderson received her James F. Byrnes Scholarship in 1950. Lois has served as a JFBF director since 1980, and has held the position of Chairman, as well as other officer roles. She is a native of Bishopville, SC, and attended Coker College. She graduated with a major in biology and taught biology, chemistry, physics and French. Lois could be given the title of professional volunteer. She lives in Columbia, (actually Hopkins), and is active in garden club, music club, book club, Family Community Leaders Club, Woodmen of the World, and Garden City Chapel, where she serves as a trustee. She is active at her alma mater and is former Chairman of the Board of Trustees at Coker. She teaches Sunday school and is very involved with many aspects of the church at Shandon Baptist Church. Lois loves to sing and enjoys telling stories of how her family sang on the front porch as she was growing up. Lois recorded tapes for the visually impaired for over twenty years. Lois takes care of many of the daily activities of a rental business which she and her daughter, Electa Anderson Small, own together. Prior to his death in 2002, Lois was married to Charles D. Anderson, Jr., for 48 years. 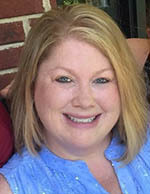 Kim Rabon Hatcher, 1992 Scholar, graduated from the University of South Carolina with a Bachelor’s of Science in Nursing. She continued her studies at the USC School of Medicine, where she obtained a Masters in Nurse Anesthesia. She currently lives in Lexington, SC and works as a nurse anesthetist with Carolina Anesthesiology Consultants. Kim has been active with the foundation since receiving her scholarship and has served on the Byrnes Scholars Board several times. She is married to Charles, and they have two children, Ethan and Avery who also enjoy being a part of the Byrnes Family. Earle Jenning "Jay" Hayes, 1982 Scholar, graduated from the University of South Carolina in 1986 with a Bachelor of Science degree in engineering. He currently works for Jarden Applied Materials as a Senior Process Engineer. He has been active with the Byrnes Foundation since receiving his scholarship and has served on the Scholars Board as well as leading game night for Super Weekends for the past several years. Jay also serves as a board member of the Lake Murray Titans Baseball Organization. Jay and his wife Tonya live in Irmo, SC, and are active in Riverland Hills Baptist church where both teach and where Jay serves in the Music Ministry and a Deacon. Jay and Tonya are the parents of two sons, Bryson and Garrett. 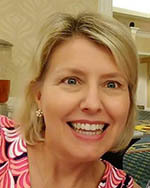 Kristine LaSalle Hobbs, 1989 scholar, graduated from Furman University with a Bachelor of Arts degree in Psychology. Graduating in 1996 from the University of South Carolina with a Master of Social Work degree, she worked for the Governor’s Office Continuum of Care as a Quality Improvement Specialist from 1996-2001. When her first child was born in 2001, she came home to be a full-time mom, has worked part-time for Sistercare, Inc., the local domestic violence shelter. She currently works for South Carolina Department of Health and Human Services. She joined the James F. Byrnes Board of Directors in 2003. Kristine is married to Bill Hobbs, they live in Lexington, SC with their two sons, a dog and a cat. 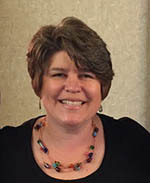 Pamela Galloway McElveen, 1984 Scholar, graduated from Columbia College in 1987 with a bachelor’s degree in English. She has been active with the Byrnes Foundation since receiving her scholarship. She began her service on the Foundation Board in 2002 and has served as secretary. She currently serves as co-chairman. Pam and her family are active in Garden City Chapel and Fellowship of Christian Athletes. She and her husband, Dennis McElveen, live in Murrells Inlet and have two adult children. Deaver "Dee" McCraw, 1978 Scholar, is the president of McCraw Corporation, an information services and technology company. 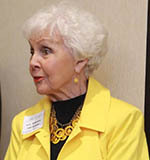 Dee has served on the Byrnes Foundation board since 1988. He is a 1978 Scholar and has served on the Byrnes Scholars board. He received the Jake Sally service award in 1992. He also serves as an Elder at Mount Moriah Baptist Church in Powdersville, SC. Dee graduated from Furman University in 1982 with a degree in Computer Science and Mathematics. He is married to Ruthie McCraw and they have a son Daiten, daughter-in-law Nicole, daughter Cameron Lenz, son-in-law Tommy Lenz and grandsons Thomas and Ayers Lenz. Carrie Fletcher Pergersonis a 1992 Byrnes Scholar who grew up in Seneca, SC. She graduated from the College of Charleston with a Bachelor of Arts in Corporate Communications. She has served on the Board since 2015. Carrie is the Business & Transactions Manager for HINGE Brokers, an early education business advisory and Brokerage Company located in downtown Greenville, SC, and prior to that was Vice-President and Broker for a Charleston-based insurance firm specializing in employee benefits. Carrie resides in Simpsonville, SC with her husband Kevin, children Allie, Emma Jean and Sam, and also with their beloved Golden Retriever Sunny and rescue bunny Pippy. Carrie is passionate about the volunteer work she and her youngest daughter Emma Jean do with local wildlife rescue Izzie’s Pond. 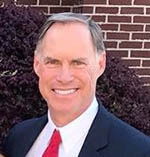 Daltrum H. "Dal" Poston currently serves as Managing Director of Issac Power Associates, providing strategic development and management consulting services to businesses in the electric utility marketplace. He previously served as vice president of Smart Grid and vice president of central operations for Duke Energy’s U.S. Franchised Electric and Gas organization. The Kingstree, S.C., native earned a bachelor of science degree in electrical engineering from Clemson University in Clemson, S.C., and a master of business administration degree from Queens University in Charlotte, N.C. Poston is a registered professional engineer in North Carolina and South Carolina . 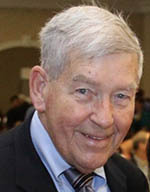 He is a 1974 scholar and chairman of the Byrnes Foundation. He is a past member of the board of directors of the National Association of Energy Services Companies, past chairman of the Southeastern Electric Exchange Engineering and Operations committee, past member of Clemson University Electrical engineering board of advocates, and a past president of the Newton-Conover Rotary Club. Poston and his wife, the former Jane Courtney, have one son Jacob and daughter-in-law Amy. Rory Priester, M.D., is a 1994 Byrnes Scholar who grew up in Hampton County, South Carolina. He is a graduate of the South Carolina Governor’s School for Science and Mathematics. He received a Bachelor of Arts degree in Biology and Biomedical Ethics from Brown University and a Doctorate of Medicine from Brown Medical School (currently the Warren Alpert School of Medicine at Brown University). After completing post graduate training in internal medicine and cardiology, he joined a large national health care organization and is a practicing cardiologist. He resides in Atlanta, Georgia with wife Nancy and daughter Sage. James Rhodes is a 1993 Byrnes Scholar, who grew up in Laurens, SC. He graduated from Wake Forest University with a Bachelor of Science in Analytical Finance and Accountancy. He has been active with the foundation since receiving his scholarship and previously served on the Byrnes Scholars board. He has been on the Foundation Board since 2008 and currently serves as Treasurer. James lives in Charlotte, NC and is the Director of Business Development for Wells Fargo’s Middle Market Banking group serving corporate clients. He previously lived and worked in New York City and has also worked for the bank’s offices in Denver, Las Vegas, Phoenix, Salt Lake City, and San Francisco. He volunteers with the Appalachian Trail Conservancy and the Friends of the Mountains-to-Sea Trail. Not unexpectedly, he enjoys travel and the outdoors. William E. Rowe, M.D., is a retired General Surgeon of University Surgical Associates unit of the University of Tennessee, College of Medicine. Currently working with Tennessee Valley Pain Management, part-time. He is a member of the first class of scholars awarded the James Byrnes scholarship in 1949. He has held various committee assignments in hospitals for over 36 years and has served on many boards. He lives in Chattanooga, Tennessee with wife, Virginia, they have children Evelyn Paige Rowe Royal Cruddas, Christopher D. Rowe, and son William E. “Ted” Rowe, deceased. 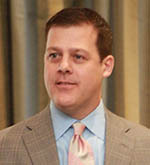 Ryan Sneed, 1995 Scholar, graduated from the University of South Carolina in 1999 with a Bachelor of Arts degree in History with a minor in Business Administration. 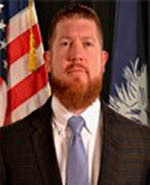 He currently works for the South Carolina Department of Revenue and manages the Department’s District Office in Greenville, South Carolina. He has been active with the Byrnes Foundation since receiving his scholarship and has served on the Scholars Board. Ryan and his wife, Lisa, currently live in Hendersonville, NC.